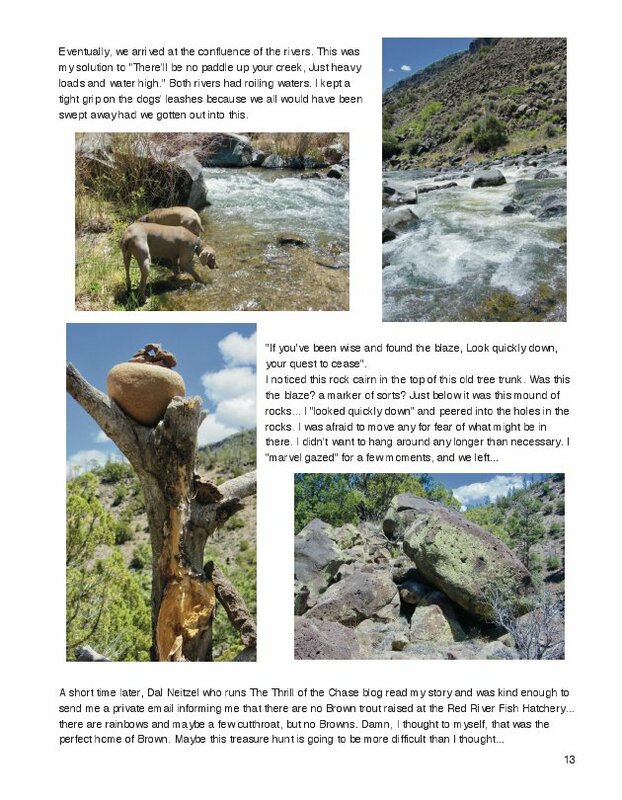 Chasing Fenn's Treasure follows a woman and her two Weimaraners as they search for Forrest Fenn's hidden cache of gold and jewels somewhere in the Rocky Mountains north of Santa Fe. In one story Cynthia writes "I made my way to the lonely stump near the center of the meadow, and decided this would be a great place to sit while grabbing a snack and sipping some water, enjoying the solitude and beauty of this particular place, wondering, Forrest, if you'd ever visited this same spot during the past several decades, maybe even sitting on this same stump... contemplating your special place... As I got up ready to leave and call it a day, I looked at that fenced-in area with the well-thing in the middle, and thought, what if? Would I be able to sleep if I leave here and don't go in there and get a closer look. I knew the answer as I meandered closer to the fence and that rickety ladder I'd noticed earlier." This letter-size soft cover book contains over 225 color photos throughout the 136 pages to take you along on Cynthia's journeys. In 2010 former Santa Fe art gallery owner Forrest Fenn published his Memoirs in a book that contained a cryptic poem, that if deciphered correctly could lead a person to a treasure chest filled with gold nuggets, coins, and gems worth over a million dollars. Fenn says he hid the bronze chest full of loot somewhere in the Rocky Mountains north of Santa Fe in 2009 or 2010, and Cynthia has been searching in northern New Mexico for the elusive trove since January of 2013. 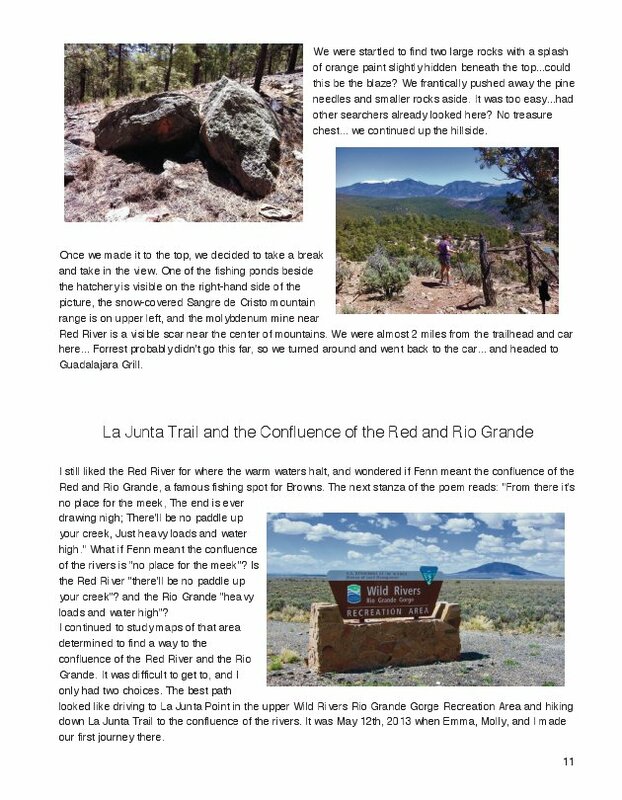 This book contains some of Cynthia's favorite Fenn treasure search stories punctuated with color photos so the reader can vicariously join her and her Weimaraner dogs Emma and Molly as they travel from their home in Rio Rancho, NM to places like the Rio Grande Gorge, the Jemez Mountains, Taos, and the sleepy old-Western ski town of Red River. In addition, for the reader who may be interested in solving the poem and putting his or her own boots-on-the ground to search for the treasure chest, this book can be used as a guide to get a new searcher started. 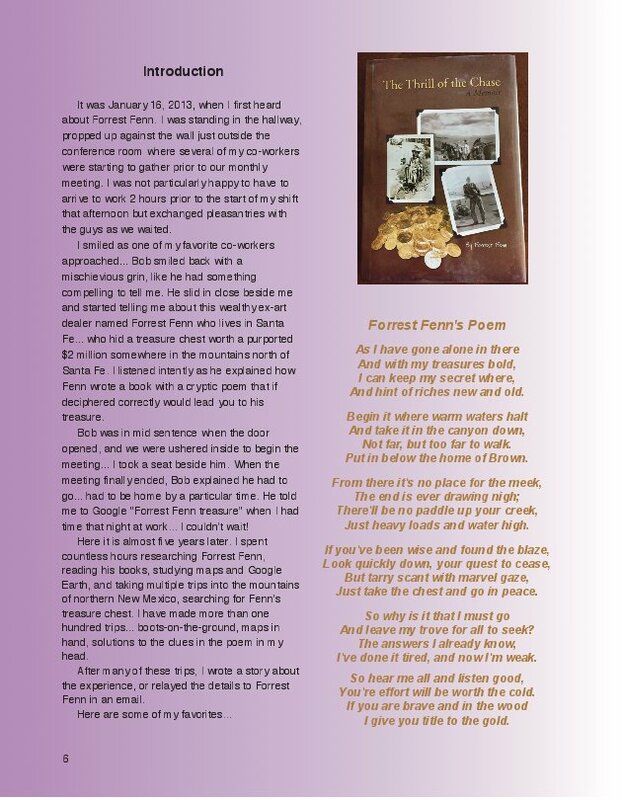 Included are four pages of Forrest Fenn quotes that may help decipher the poem. 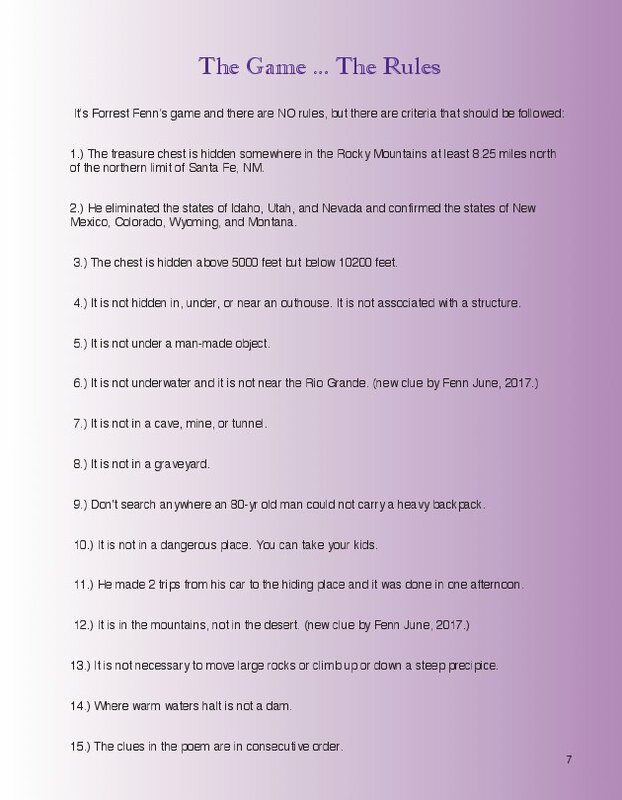 Fenn's cryptic poem is included, as well as a page of criteria that Forrest has stated publicly over the last 7 years. There are several pieces of advice from Forrest to Cynthia the author as well. 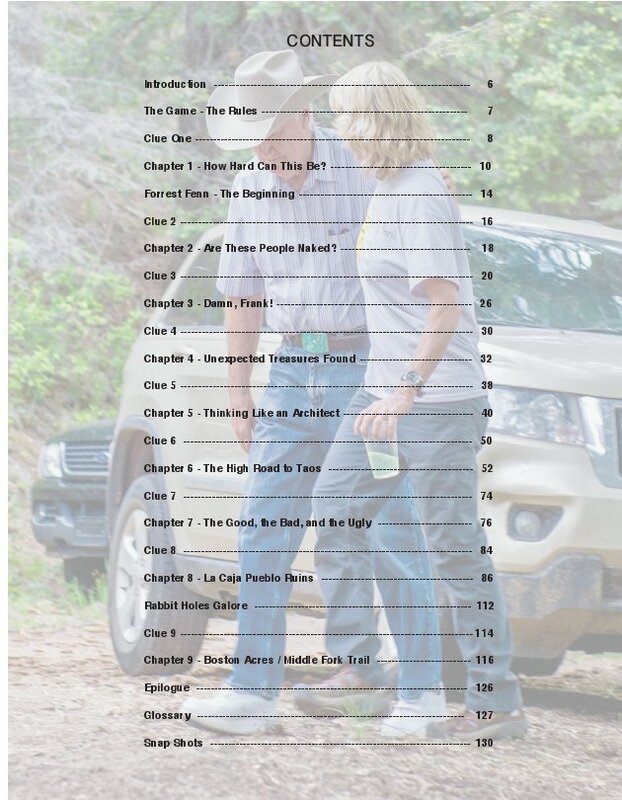 Included is a chapter dedicated to the Charmay Incident that occurred on various blogs in the fall of 2015 after Charmay (Fenn's publishing partner) told Cynthia at the La Fonda Book Signing "where Forrest said he wanted to die." Included is the rebuttal letter written by Cynthia and Forrest to appease the conspiracy theorists, but was never published, until now. There are several pages dedicated to what the blog readers have coined "Rabbit Holes", as well as a few snapshots of Forrest in his home with the author and friends. And lastly, strewn throughout the book are the author's interpretation of which lines in the poem are the NINE CLUES. 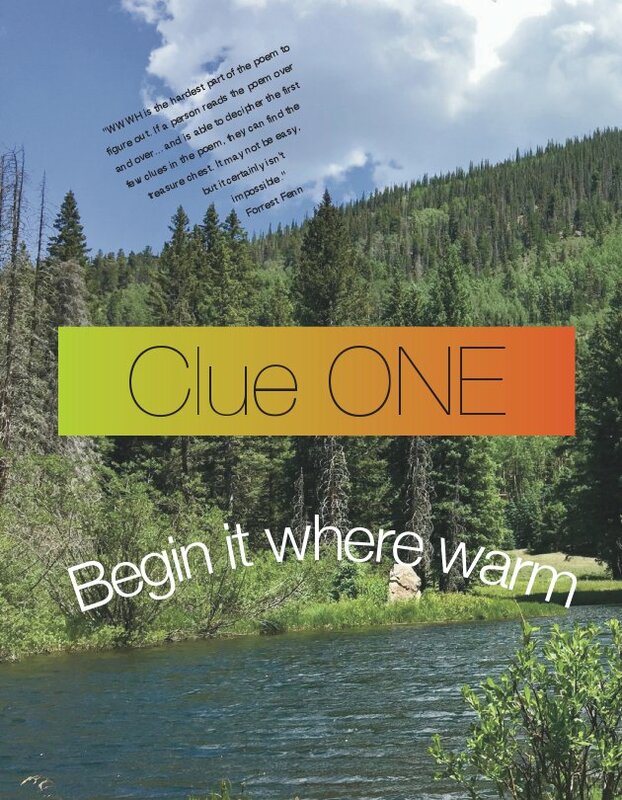 As a kid growing up in rural central Pennsylvania, Cynthia enjoyed the adventure of the great outdoors, camping with her family, reading mystery books, and solving puzzles, riddles, and logic problems. Most of her adult career was spent as an engineer in the semi-conductor business. 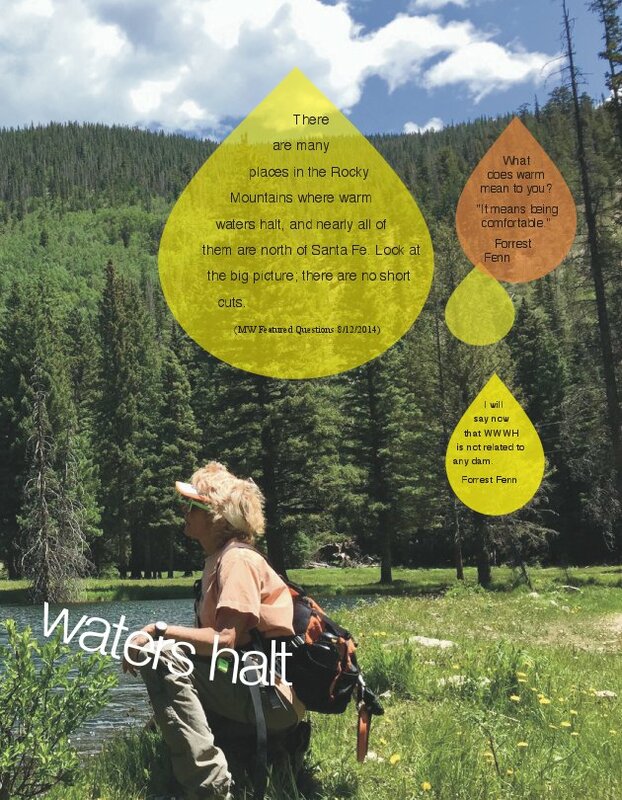 Her vacations consisted of traveling to the Rocky Mountains where she skied and backpacked. At age 40, Cynthia's partner and dogs and she left Florida where she started her career in the semi-conductor business and moved to Albuquerque, New Mexico, where she continued to work until early retirement at age 61. 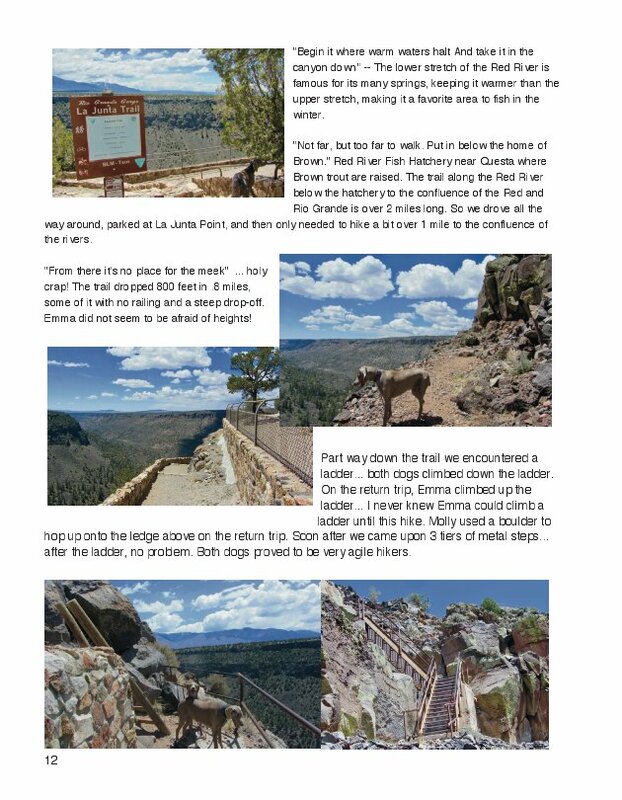 Cynthia had been searching for Forrest Fenn's treasure in northern New Mexico for a couple years when time permitted but retirement gave her the time needed to search much more frequently; thus, as of summer 2017, she has been out looking for Fenn's treasure chest over 100 times. Cynthia often wrote a story about the day's search and often sent them to Forrest in an email or to Dal Neitzel to post on his blog The Thrill of the Chase. A couple years ago Forrest encouraged Cynthia to put her stories into a book. This book includes some of her favorites.